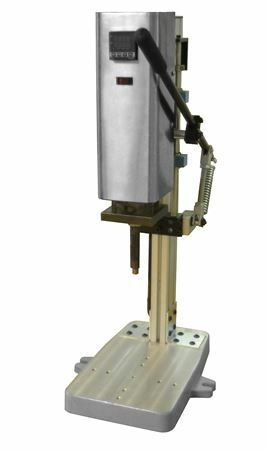 Ideal for R&D or production, the TMHS400 is perfect for staking, swaging, inserting and degating. This compact and rugged bench-top unit has many features found in our pneumatic heat staker including digital temperature control and screw-in tip design. No compressed air…just plug it in and go! Three to four week lead time. Digital temperature control with readout. Adjustable height, mechanical stop and threaded tip receiver. Base plate with threaded tool mounting pattern. Standard Flared Stake The standard flared stake satisfies the requirements of most applications. This stake is recommended for bosses with an O.D. of 1/16 inch or larger, and is ideally suited for low density, nonabrasive amorphous plastics. Spherical Stake: The spherical stake is preferred for bosses with an O.D. less than 1/16 inch (1.6mm) and is recommended for rigid crystalline plastics with sharp, highly defined melting temperatures; for plastics with abrasive fillers; and for materials that degrade easily. Hollow Stake: Bosses with an O.D. in excess of 5/32 inch should be made hollow. Staking a hollow boss produces a large, strong head without having to melt a large amount of material. Also, the hollow stake avoids sink marks on the opposite side of the component and enables parts to be reassembled with self- tapping screws should repair and disassembly be necessary. Knurled Stakea: The knurled stake is used in applications where appearance and strength are not critical. Since alignment is not an important consideration, the knurled stake is ideally suited for high volume production, and is often recommended for use with the Thermal Assembly System. Swaging: Swaging uses the controlled flow of molted plastic to capture or retain another component (usually of another material) in place. All swaging tips are custom made to ft the application. Side Swaging — One common swaging tip configuration is the “Side Swaging Tip”. Designs requiring the retention of glass lenses or other components require “side swaging” and can be successfully accomplished using angled probes contoured to form the plastic posts to the side, capturing the component by its edge. When a regulated and controlled heat source contacts and transfers heat to a metal insert, it is called insertion. The insert is placed in a hole, either straight or tapered, in accordance with instructions from the insert manufacturer. As the insert is heated, pressure is applied to the insert. The transfer of heat from the insert to the plastic softens and melts the plastic, and the insert is pressed into the molded plastic hole. The molten plastic reflows into the undercuts and features on the outside of the insert body. It is necessary for the pressure applied to the insert to be sufficient to drive the heated insert into the plastic but not so excessive as to crack the plastic during insertion. The final placement of the insert in the plastic should be flush to slightly above the top of the hole, not recessed. Because a recessed insert allows vertical movement, it will cause a jacking out of the insert and thereby lower the performance of the insert. The temperature of the heated tip doing the insertion must be at or above the melt temperature of the plastic sub straight. When a regulated and controlled heat source heats a metal blade that melts the plastic in the gate area and separates the runner from the molded part, it is called degating. The combination of heat and pressure applied to the part(s) during degating should be sufficient to preform the degating but should not excessively melt the plastic in the gate area or allow the cracking of the part. Metal blades have to be designed to ft each application. Gate areas in excess of 0.25" x 0.25", depending on the plastic, may leave a smearing of the plastic. Staking: Also referred to as “heading” or “riveting”, staking is the process of forming a plastic stud (boss) over another component to hold the two pieces together. called insertion. The insert is placed in a hole, either straight or tapered, in accordance with instructions from the insert manufacturer. Degating— Degating Blades are custom made for your application. Swaging Tips— Swaging Tips are custom made for your application.